Home > About ThinLine Tack > Who buys ThinLine and why? You want horses to work with maximum comfort. ThinLine distributes impact, weight, and heat so your horse will become more comfortable during work. Add ThinLine’s anti-slip abilities (found on all products), and you will see your horse develop confidence and balance. All horses lift their backs more in a ThinLine, resulting in fitness, better engagement, and suppleness. Even the best riders know there is always room to get closer to perfection. If your seat could be quieter, why not? Ultra ThinLine stabilizes the rider; creating quieter seats leading to better communication and improved harmony. Because ThinLine absorbs impact by dispersing it laterally, along the pad, riders are able to sit with little to no bounce. Once the seat is truly still it takes only a subtle cue for clear communication. If a therapeutic saddle pad is working for a horse, the rider should feel it on their back too. ThinLine is the only product endorsed by Spinal Surgeons for riders. Shock absorption works laterally rather than recoiling back into the riders and horses’ spine. It is sold and endorsed by veterinarians, equine chiropractors, saddle fitters and equine massage therapists’ around the world. The shock absorption is truly one of a kind. Because we know saddle fit is critical to keeping horses comfortable ThinLine worked with Master Saddlers to develop the perfect shim. Shims are made of either ThinLine 1/4 inch or Ultra ThinLine 3/16″. Each is cut with a bevel to ensure there are no pressure points and designed to fit each pad we sell. By adding an additional layer of shock absorbing ThinLine you are guaranteeing comfort. 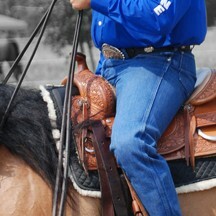 Front – for Wither Relief Rear – to lift the cantle Bridging – promote new muscle tone for the sway back. ThinLine does not pay riders for endorsements. If a Professional suggests you try a ThinLine product please be sure to thank them. Intermediate riders are all interested in riding better and are always searching to discover ways for horses to perform better. Let’s face it, it’s fun to win. Invest in a ThinLine basic pad. It will improve both your riding and your horses’ way of going. Use ThinLine for your school horses. ThinLine will protect their backs allowing horses to remain sounder longer and giving students the opportunity feel a correctly lifted back. For the students, ThinLine will accelerate the learning curve. Riders will be able to sit the gaits faster and create a bond with their horse. Feel free to call us anytime. We are here to be at your service. Do you wish you could sit quieter and make your aids more subtle? Do you wish for better contact? Is your back sore after riding? If you answered yes to any or all of these questions we hope you will try a ThinLine pad to see and feel the difference it can make. We are so confident you and your horse will see a difference we offer a money back guarantee.